We're pleased to announce that the new urban bench standard for New York City was designed by our very own Director of Design, Ignacio Ciocchini. If you've ever looked for a place to take a break on a New York City sidewalk, you're probably well aware that there is a shortage of adequate seating options in the city. 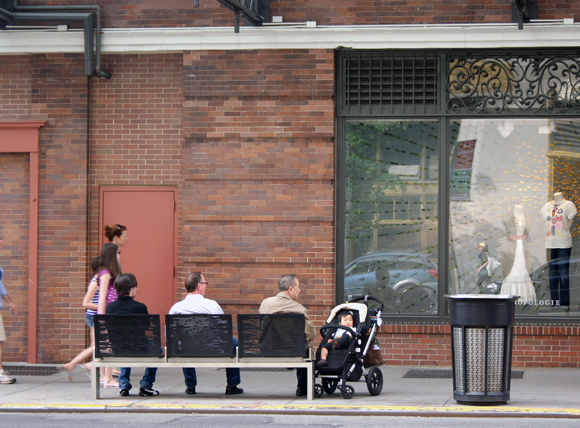 Though New Yorkers tend to find creative alternatives like stoops and curbs, the NYC DOT has plans to make everyone more comfortable with the new CityBench initiative. 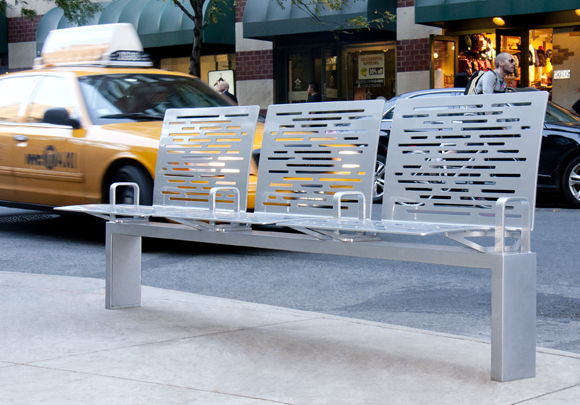 Over the next year, the city will install over 1,000 benches throughout the five boroughs. Much like the City Racks and Million Trees initiatives, the CityBench program will provide these streetscape amenities free of charge. You can bring the bench to your neighborhood, by filling out the simple request form online now. A version of this bench was first designed for our sister organization Chelsea Improvement Company. Mr. Ciocchini explained that the benches are made of carbon-steel parts that are e-coated and powder-coated resulting in a very strong and long-lasting finish for outdoor urban use. The laser-cut pattern on the seats will not only dissipate heat in the summer, but also allow snow to fall off in the winter. Try out the benches now in TriBeCa or in our Chelsea District, and view more photos of the CityBench installed on Greenwich Street on SWChelseaNYC's Flickr.